Buy SBV Excelsior Tickets Now! SBV Excelsior 2018/19 Tickets Are Available! Founded: 1902. Nickname: The Kralingers Roodzwarten (red-blacks), The Wonder Oud papier-club (Paper recycling club). All Time Top Goal Scorer: David Connolly (42). Based In: Rotterdam, Netherlands. President: Bob de Lange. Overall Most Appearances: Ryan Koolwijk (211). League: Eredivisie. Manager: Adrie Poldervaart. Main Rivals: Feyenoord, Sparta. Venue: Van Donge & De Roo Stadion. Captain: Ryan Koolwijk. Major Honors: 3-Times Eerste Divisie Winners. Kit Manufacturer: Quick. Colors: Red and Black. Key Players: Anouar Hadouir, Ryan Koolwijk, Luigi Bruins, Jurgen Mattheij. Main Sponsor: DSW Zorgverzekeraar. Team Mascot: Woutje Steijn. Last Season: Eredivisie: 11th Place | KNVB Cup: 1st Round. In the 1929-30 season the club reached KNVB Cup final, but lost it to Feyenoord 0-1. SBV Excelsior is the smallest football club from Rotterdam. Besides Excelsior, these clubs are Feyenoord and Sparta. Until 2015, Excelsior was a satellite club of Feyenoord so they was composed by Feyenoord players. 3-Times Eerste Divisie Winners: 1974, 1979, 2006. Excelsior Goalkeepers: Alessandro Damen, Sonny Stevens, Maarten de Fockert. Excelsior Defenders: Siebe Horemans, Herve Matthys, Thomas Oude Kotte, Robin van der Meer, Jurgen Mattheij, Desevio Payne, Lorenzo Burnet. 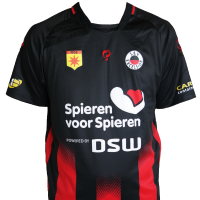 Excelsior Midfielder: Jerdy Schouten, Anouar Hadouir, Ryan Koolwijk, Luigi Bruins, Ali Messaoud, Dogucan Haspolat, Marcus Edwards. Excelsior Forwards: Elias Mar Omarsson, Jinty Caenepeel, Mikael Anderson, Denis Mahmudov, Mounir El Hamdaoui. Excelsior vs AFC Ajax tickets | Excelsior vs Emmen tickets | Excelsior vs AZ tickets | Excelsior vs De Graafschap tickets | Excelsior vs ADO Den Haag tickets | Excelsior vs Feyenoord tickets | Excelsior vs Fortuna Sittard tickets | Excelsior vs Groningen tickets | Excelsior vs Heerenveen tickets | Excelsior vs Heracles Almelo tickets | Excelsior vs NAC Breda tickets | Excelsior vs PEC Zwolle tickets | Excelsior vs PSV tickets | Excelsior vs Utrecht tickets | Excelsior vs Vitesse tickets | Excelsior vs VVV-Venlo tickets | Excelsior vs Willem II tickets. Football Ticket Net offers all SBV Excelsior home & away fixtures for 2018/19. Please browse through the selection of tickets on offfer and choose the right ones for you. The choice is huge. Please be aware that all SBV Excelsior fixtures are subject to change date and time, which is out of our control. Please note that Football Ticket Net is not connected to SBV Excelsior or to any official organization such as the or Dutch Eredivisie.